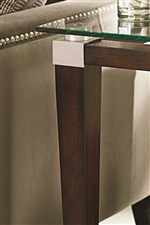 Accent your contemporary sofa with a chic, square end table. 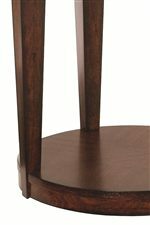 The striking look of this table comes from modern style adornments, like tall, tapered block legs, square mouldings, and a glass top offset with bright metal caster hardware. This striking piece will surely add a polished appeal to your living room, and it provides an ideal display area for an eye-catching decorative object. The bottom shelf offers storage space for magazines, books, or a storage basket. The thick glass table top is tempered to resist breakage and scratching, and is easy to clean and maintain. The Solitaire Contemporary End Table with Glass Top by Hammary at AHFA in the area. Product availability may vary. Contact us for the most current availability on this product. The Solitaire collection is a great option if you are looking for Contemporary furniture in the area. Browse other items in the Solitaire collection from AHFA in the area.